We will travel with the Texas-based Discovery Tours. Discovery Tours is a family owned and operated tour company that has specialized in Holy Land Tours for over 30 years. This is the same tour company used by Johnny Hunt, Jack Graham, Robert Jeffress, Ed Young, Ronnie Floyd, Josh McDowell, and Tim LaHaye when they take groups to the Holy Land. 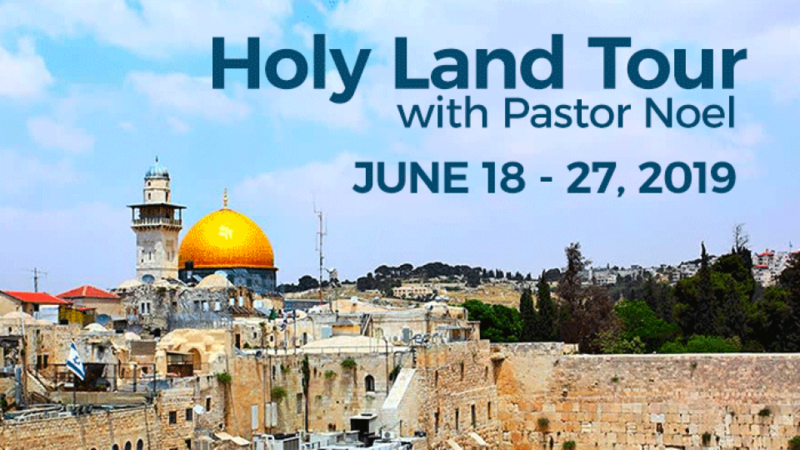 Tours will be jointly led by a tour guide/historian who will provide the historical and geographic information and by Pastor Noel who will share devotional insights that can be gleaned from each location. Full Package Cost: $4,715 per person (two people per hotel room). This price includes flight, travel, lodging, meals, and tickets. Ground Only Cost: $3,060 per person if you provide transportation to/from Tel Aviv. This price includes travel, lodging, meals, and tickets. Spots are limited. First come; first serve. Deposits required to reserve your spot. For complete itinerary and to sign up, click here!